Let me be clear about a few things before I get started on this enlightening rant. I’m not mad/angry/bitter towards well meaning people who try and encourage those of us who are single. I understand that MOST of them were not single as long as some of us have been. So, they don’t understand that we’ve heard the same things many, many, many, many, many times before. Sure, repetition can sometimes be helpful. Like when trying to memorize the colors of bomb wires so you know which ones are safe to cut and which ones aren’t. They also don’t understand that even though cliches are cute, they are seldom helpful. When it comes to encouragement for the single ones around you, let me let you in on a few things. Some of us single people feel shame about our singleness. We often wonder what’s wrong with us. Do guys prefer short hair and mine is long? Do guys prefer girls who drive cars without rust spots? Do I not pray enthusiastically enough in public? Should I lose 50-100 pounds because I’m too fat for a boyfriend? Am I too opinionated? Too passionate? Too short? Just some of the words or thoughts we struggle with. For some of us it is a daily struggle. Some days I can’t go to a church service, young adult meeting, grocery store, or gas station pump without wondering why I’m single. I’ll look around and wonder how they have someone and I don’t. Ya, sure, I’m judgmental. Add that to the list of reasons why I’m single. Seriously though. There’s this idea that you must be messed up if your still single. That if you had your crap together you’d be married by now. There’s some sin you haven’t dealt with and your singleness is a punishment from God. Yes, I’ve often thought God withheld a good thing (like a spouse) from me because I wasn’t perfect. Horrible theology, I know, but it seemed like the only viable solution. God hates me, I’d think. Also, married people tend to think that we have these Hollywood ideas in our head about marriage. No, we know marriage won’t solve any of our problems. We know it won’t be easy. We know its not all hand-holding, giggling and loving eye gazes. We get that some days you struggle with how you could love the person farting in the bed next to you. We get it. It’s also not helpful to tell people they’re “too picky”. Listen, I didn’t wait 30 years to marry some schmuck. Sure, he may not be a bearded lumberjack who will sing me love songs and buy we chocolate when I’m being an emotional basket-case, but he’s not going to be just any schmoe. Trust me, I’ve gone on dates with schmoes. It’s horrifying, but the stories lend themselves as warning signs for the teen girls I counsel. I once heard, “You’ve got to be a Ruth to get a Boaz”. There’s a lot of encouragement that mirrors this sentiment. Please, don’t tell single girls this. Ever. Firstly, the story of Ruth is a tad bit weird. If it were a movie, there’d be wedding bells as the credits scrolled, but God never intended it to be a chapter in the “How to Snag a Mate” book. Besides the fact that its not practical in our society (we don’t follow the Old Testament kinsman redeemer protocal in this century/country)– it was meant to be used as an example of our relationship with God. Secondly, this type of encouragement adds fuel to the “I’m not good enough” fire already raging in our minds. EVERYONE (single, married, divorced, widowed, etc.) is going through a process of growth in their lives. Hopefully, we are getting more mature, more loving, less selfish and all that good stuff. Saying that there’s some kind of running rubric for my character and that when I get a certain grade THEN I’ll be ready for marriage is….dumb. I should state here that I’m not saying that married people believe this. What I am saying is that sometimes the things we say can come off a certain way. Like, for instance, that we’ve got our crap together and you don’t. I assure you all, I am not perfect– just in case you thought that or something I said made it seem like I thought that. NEWS FLASH: That’s not happening. Not today. Or the next. I don’t know how you just stop wanting something like that. Ask me to stop wanting chocolate, and I think that’d be an easier battle to win. And I’m the girl who eats chocolate everyday. Like its MY JOB. And define: “looking for”. I mean, I want a husband. I’m certainly open to the possibility of going on a date with the guy helping me at Verizon. Or contemplating stopping my car in the middle of an intersection because I saw a bearded fella, wearing a red flannel shirt riding a motorcycle (This thought did actually go through my mind). But I’m not at home every night staring out my window longingly with a can of Nutella in one hand and a spoon in the other. Ok, SOME nights I do have a heaping spoon of Nutella, but I’m never starring out the window at the same time. 😉 I’m still living life. I’m still enjoying my friends, my family, the opportunities I get to serve. I just also want someone standing next to me and enjoying it all with me. I’m also not looking for a man to complete me. I am looking for a life partner because life seems more FUN when you’re experiencing it with someone you love. I guess I should leave all the single people reading this with some encouragement. A few weeks ago my (married) BFF sent this to me. In all my years of hearing all the cliches, Bible verses, etc. this has been the thing that has brought more life and hope than anything else. P.S. If you happen to be a single, bearded, flannel wearing gentleman then look no further! I’m witty (obviously), I ‘m a brilliant writer (again, obviously) and I’m pretty good lookin’. Love it. It’s funny, a great perspective, romantic, and you sound like an awesome person. Some of the most BEAUTIFUL marriages I know are between two people who waited a REALLY long time and I really really hope that doesn’t sound cliche or trite. 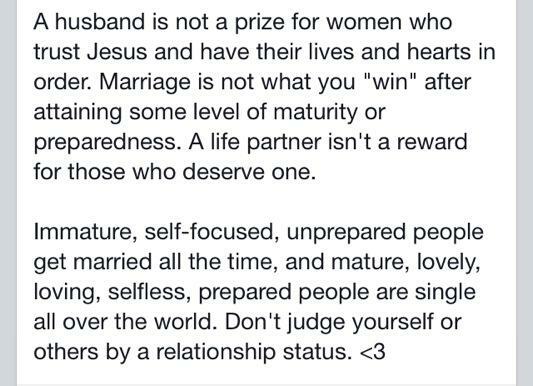 I totally enjoyed this post, and I’m married. But I do remember all the pain I had from time to time being single. I mean all through my teens there were only a few eligible men in our church (the rest too young/old/married). We would be like vultures anytime a new guy strolled in. It was so sad. Especially to think that we got to a place to take anything over nothing. I remember making a promise to God at 16, that I wouldn’t date unless the next guy was the “one”. Boy was I peeved when God held me to it. I don’t know how many times I was like “God, you knew I was joking right?! Gimme a man! I just wanna at least date and be “normal”. Then fast forwarding to bible school. I mean if you ever have a great pick of the litter it’s there. You at least know there’s a 95% chance you’ll get someone whose godly. But I went through my time remaining single. We even called the handful of us that didn’t date anyone, get engaged, or get separated for by RA’s from a boy, ‘the remnant’. Lastly on my journey I ended up working at Christian retreat. At this point you could call it a cruel joke. I’d be lying if I said it didn’t get to me, having a new influx of godly men each weekend file in and file out without my number. I say in just a small glimpse of my past sadness and frustration as a single to say: I get it. I understand. Some of my loneliest times were when I was single. I was sick of the cliches and spirtual explanations given. My favorite “it’s easier to go on missions trips and do God’s work because you’re not tied down”. It’s true in a relative sense but it makes God seem mean and selfish in the broader picture. It’s like saying God designed marriage, this wonderful life changing thing, but you have to chose whether you want to serve Him unrestricted or be married. You can’t have both. You can’t have the cake and eat it too. But God created it right? Created it to what? Make me seem selfish? Ugh! Now that I am married, I try to remember my single years. Not to think of the good ol days, but to make sure I don’t say something stupid to someone whose still single. I know how much I hated it and tried to smile when I wanted to just slap them with my bible, hit them with my car, say “get behind me satan!” I think the best thing married people can do is be good listeners more than advice givers. Hear a single persons frustration out but don’t try to fix their situation or explain away their feelings. Loneliness can be relative. Some of my loneliest times too have been as a married person, but I don’t need a well meaning Christian telling me I’m wrong. So finally, I will keep reading your blog. I think it’s great. Keep expressing yourself. And marrieds: ease up a bit, give advice if it’s asked. Otherwise be a good ear and less of a mouthpiece! I love it! I actually had a married friend beg me not to settle. She loves her husband but readily admits she settled for him instead of waiting for a better match. It was one of the most encouraging thinfs I’ve heard. Emma, it’s amazing that you had a friend who was willing to be that honest with you. I’m obviously still single, but I see how quickly I’ll even just be distracted by the wrong dude just cause he’ll give me attention. I didn’t wait this long to get a dud. Thanks for commenting! I’m married but I could write this same post for people “encouraging” me to have kids. Don’t listen to the well-meaning “encouragers”. There will always be another milestone (marriage, kids, graduation, promotion, home-ownership, SOMETHING) for them to nag you about. Love yourself as you are, where you are, today. haha! You are right on about that– there will always be SOMETHING people are telling us we should be doing, or feeling. I’ve been one of those people struggling to enjoy the NOW because I long for the THAT or THEN. Not until recently, did I figure out that I’ll never be happy with x,y,z until I can be happy without it. Not exactly “there” yet, but I’m at least figuring it out. Thanks for reading! My husband was single until age 39 when we got married. He struggled with many of the same things you wrote about. Thank you for this perspective. It’s nice to hear that guys can also relate. SOME guys. 🙂 I’ve had a few guy friends message me and say “That’s how you feel?” Ahhhh, ya. 🙂 Thanks for reading, Tammy! I wish sometimes that I would have put into words as eloquently as you do, my thoughts when I was single, so that maybe some of the well meaning people, quite frankly would mind their own business. Though I would say for all the obnoxious advice, the books given to me hoping that I would learn about how to be good wife material (who writes these? ), the pats on the back, the weddings attended where I just wanted to celebrate my friends but would get the pitying looks and comments, for all of those, there were those people who listened to me talk, rant, and cry, I knew they were praying and carefully speaking a thought of their own which was actually encouraging. Thanks for sharing who you are, your thoughts and for being one of those people in my life who encouraged. Love you dear friend and am encouraged to shut my mouth and remember what I needed, not very long ago. I’m so grateful for people in my life who have, in their own ways, been an encouragement. I think we (people in general) say a lot of dumb things with the intent to help. Singleness is just an easy (although very popular) topic to pick on. And maybe just because its so fresh in my own heart and life. I’m especially thankful for your love and friendship and your wisdom in this area and so many others. You’re an amazing treasure to me! The reality is that many single men and women are looking for “prince charming” (I know, I have several friends and acquaintances who so set in their ways and enjoying their ‘vices’ that it would take any man a huge effort to even live up to their standards and ways of life). But maybe as Christians we are also focussing too much on only Christians when there are so many great Jewish or even (dare I say it!) agnostic men (and women) out there! (and other religions – and I know that this can present a huge hurdle for some people, but do you not fall in love with the person first and then deal with ‘the other stuff’? Or is religion that important that you may not realize that you are actually limiting yourselves?) I think spirituality is possibly more important – recognizing that there is ‘something’ out there, but not getting fixated on what or who it is and what they are called. Thank you for your comment, Sabine, and for reading my blog. I appreciate it. There are certain areas, that I will remain steadfast in, in regards to a mate. I joke about wanting certain things (MOST of those things are just silly variables). But I won’t move on certain things, and I don’t see that as being picky, I see that as me knowing that if I am going to spend the rest of my days with someone, I don’t want it to be just anyone. If that means, I really am “Forever Alone” than I’ll take it as it comes. Sometimes I could keep my mouth shut and just mentally renounce the lies they said. But sometimes it would start getting to me, and I would need to firmly, but (somewhat) politely, point out their lies to them. To their face. In love. It sounds like that’s already what you’re doing. Living the life you have now instead of pining for the one you don’t. (Being on the look out is not pining.) Go girl. Thank you so much for this comment. You bring up a really good point. The moment I actually start dating someone or get engaged those same people will have something to say. There’s no winning! Sometimes I make sassy comments to people. Most of the time, I behave. I’m trying to be more gracious. Trying is the key word there. Ya, there’s no sense in pining. For now, this is life. Like it or not. Better to like it! 🙂 thank you again! It was really genuinely encouraging. Great thoughts! I could make a whole list of things that people may not want to say to single people! And for the record–it’s not just single ladies who struggle with wondering what’s wrong with them. Guys may not face that as often or as strongly, but it’s definitely still there. Thanks for reading and commenting, Dustin. Ya, the list goes on and on. I’m assuming you’ve read some of Acuff’s posts on this, too, right? If you haven’t I think you’d enjoy them. 🙂 Also, it’s nice to know that’s a universal struggle. This may sound a tad judgy…and maybe it is….but sometimes I look at couples and think “How are THEY married and not me? !” Ehh, the struggle. This is awesome! Found your blog from Liz’s guest post from you and I’ve been skimming through. I feel like we’re kindred spirits. 🙂 lumberjacks are totally my things as well! Haha 🙂 thanks for sharing! Hey! I’m late in commenting on this post, and just found your blog through your comment on Jon Accuff’s blog. I thought what you wrote was witty and true – about not needing a marriage certificate to decorate your house for Christmas – and also thought you looked so pretty in your profile pic :). You have a very fun and well written blog! Just wanted to give you the other side’s perspective on this post – when I got engaged, a girl in my bible study a the time acted like I did something TO her. She actually said she thought she deserved it more because she did a lot more stuff for God than I did. Btw, at the time I was living away from ALL my friends and family, desperate for connection (yup, just because you find a guy, doesn’t mean you don’t need girlfriends – feel VERY blessed that you have them!). Her attitude hurt a LOT because I mean, she was the freakin’ bible study leader, so at first I’d innocently thought I’d found someone to trust. This made me skittish about friendships for YEARS, and just now (oh, only 7 and a half years later) I’m healed from this and finally have opened up to some good friendships again, both single and married (one of my besties has gone through a bad divorce but still is one of the most encouraging people ever). Anyway :). This comment didn’t actually have a point lol, except to say that you rock, and that yes, married people have TONS of issues, but we need fun friends like you too! Hi Anne!! Thanks so much for this comment. And you are 100% spot on. We (all of us) are allowed to have feelings or emotions, and that doesn’t mean we can take out our own grief on other people. I’m so sorry she treated you that way. It’s my heart to celebrate with those who celebrate and have joy with those who have joy. I don’t always get it right, but I always try and keep that in mind. My very best friend (and some of my closest friends) are married and I wouldn’t trade her for the world. She brings me into her family and let’s me join in the fun. She cries with me when I’m grieving that I don’t have a family of my own. We absolutely need each other. That is so, so important. Thank you for sharing your story with me.